Over the past 5 years, the shooting industry has seen a definite trend in the market when it comes to preferred choice of calibers for concealed carry and duty use. The 9mm now seems to reign supreme on the retail market by being offered in every semi-auto pistol being released and even a few revolvers! There are several reasons for this new market swing that haven’t always been so obvious or available. 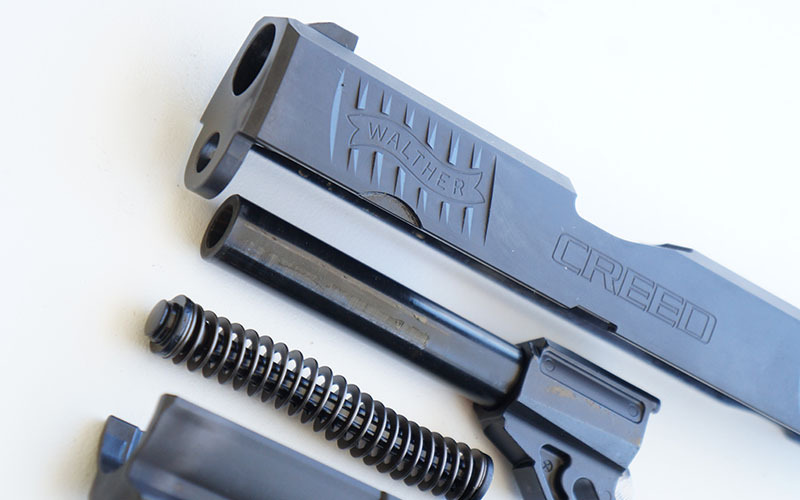 One company that has long embraced the 9mm platform is Walther Arms by currently offering a wide range of pistols available in their catalogue including a new semi-auto called the Creed. 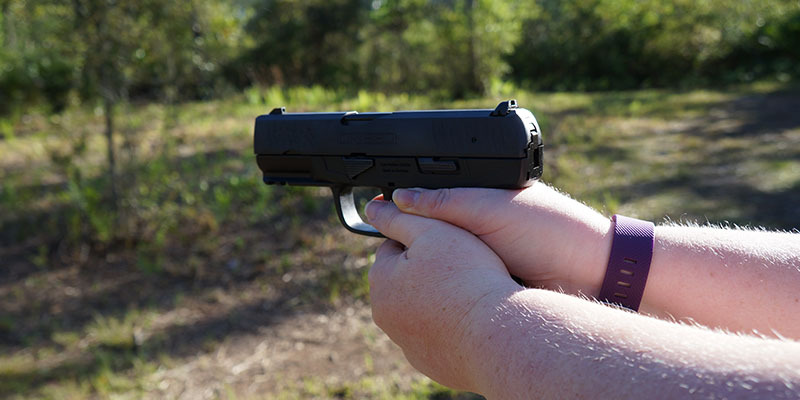 This week, we will look at how this recent industry trend has come to be and why the Walther Creed may be the best choice for shooters looking for an accurate and affordable new full size 9mm pistol. In the 1980’s, law enforcement and military personnel transitioned from the old reliable .38/.357 revolvers to the 9mm semi-automatic platform with ball ammunition. While this was a great leap in round capacity, the politics and round performance weren’t ready for the responsibility. The policy and law makers were uneducated and ignorant of how the 9mm ball round performed while at the same time, seemed to demonize the much more effective hollow point option. In the 90’s, well into the early 2000’s, police departments, civilians and select military operators seemed to transition to either the .40 caliber for .45 ACP for better advertised performance. During this time, huge advancements in ammunition took place while the truth about others came to view. The public learned the initial data of the .40 caliber’s performance was greatly over hyped and loosely taken from its larger predecessor, the 10mm rather than true .40 cal ballistics, terminal velocity and effectiveness in a rush to secure sales for the new round. The loss of high capacity magazines and smaller, more manageable frames seemed to be in direct contrast to the new face of military and law enforcement who were now made up of three times to amount of smaller framed men and now women into the forces. 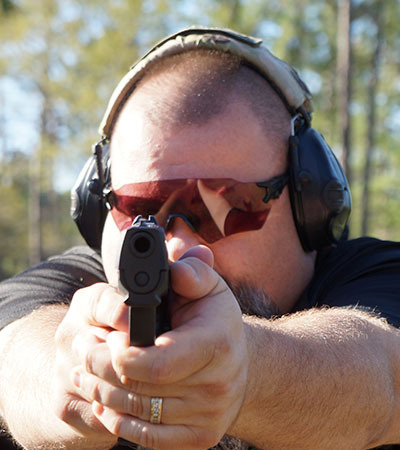 Due to training and equipment budgets, the slow transition back to 9mm firearms was now accompanied by better understanding of ballistics by those with the decision-making power for their departments and agencies. The civilian market, as always, followed the military and law enforcement path in making the switch by huge numbers. Even to date, the US military in several aspects are still switching over to more 9mm firearms as we speak. While some companies are rushing to produce affordable and reliable 9mm pistols to catch up to the market swing, Walther Arms has always been at the forefront of the market and ready to meet new customers with an already established line of pistols such as the new Creed. 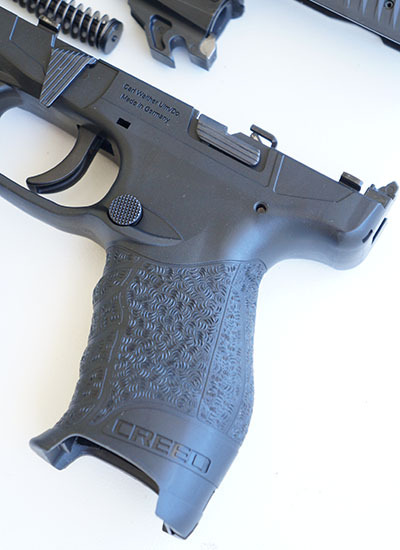 When our review sample of the Walther Creed arrived at our local shop for pick up, I was eager to get started based off the great experiences we have had with other Walther products. As I opened the signature black plastic storage box, my first thought was the Creed was larger than I expected. From the advertisements, I had seen from Walther, nothing gave an indication of its size in their photos or marketing. I had read and heard a great deal about how the Walther Creed could make for a great concealed carry gun in the same conversations about much smaller and lower capacity pistols such as the Glock 42 and Smith & Wesson Shield. I had to laugh at myself for assuming the Creed would be smaller due to the fact I personally carry a Glock 19 every day which is almost exactly the same size. Measuring 7.3” overall vs the G19’s 7.28” overall length, the Creed weighs a hefty 27 ounces in relation to the Glocks 23.65 ounce weight. Perfect example of the dangers of “assuming” right? 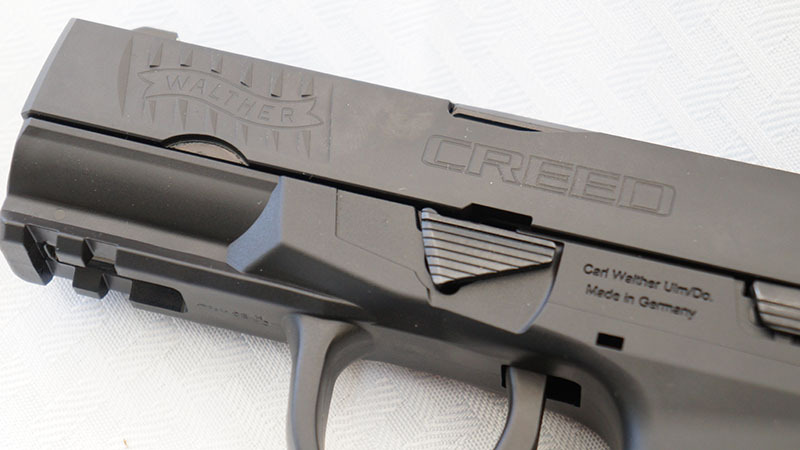 Another surprise with the Creed came when I realized the Creed was unlike the other pistols we have recently reviewed from Walther in that it was a Double Action only with a very low profile bobbed hammer rather than a striker fired pistol. Again, nothing in the marketing ads combined with the sleek, clean lines of the gun in photos eluded to this not being another striker fired pistol on the market. Holding the pistol in your hand for the first time, the Creed definitely has the balance and feel of a striker fired gun. I quickly noticed the lack adjustable grips or back straps which is the vogue in polymer guns these days. 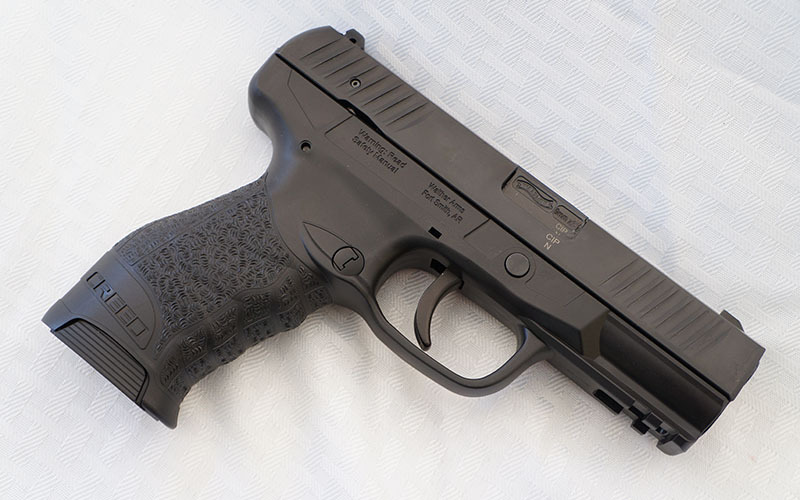 The curved trigger guard instead of a checkered square guard is another option removed from this stripped down, basic pistol Walther is offering to the budget conscious and new shooter. 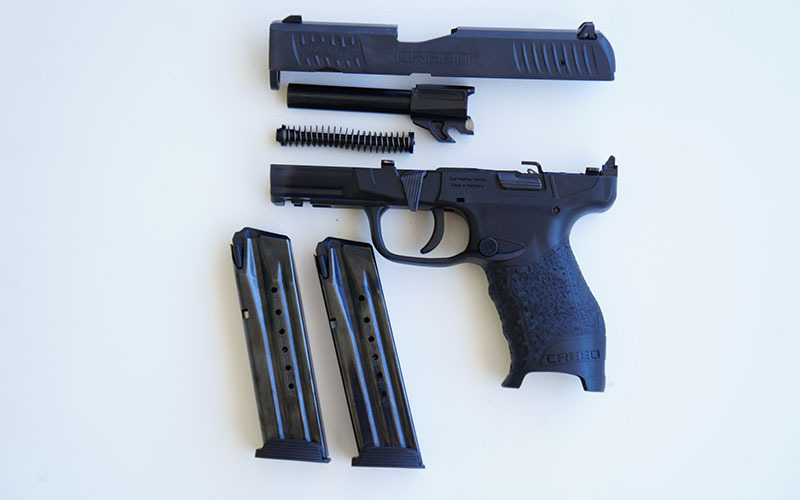 I was happy to see Walther include a very tough and durable Tenifer finish many Glock shooters may recognize as a huge plus over cheaper industry finishes. The more I stood and inspected the Walther Creed, the more eager I was to hop on the range as soon as possible and get some rounds down range with it. 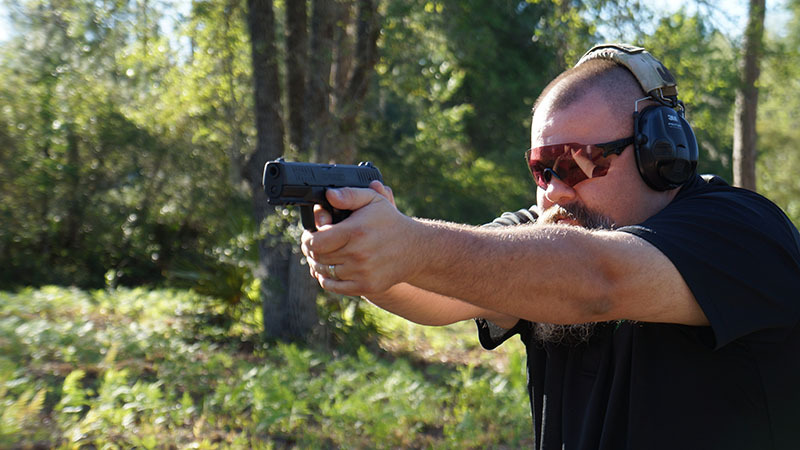 Not long after receiving the Walther Creed from the gun shop, my schedule quickly cleared to make a trip out to the private training grounds affectionately known as “The Swamp” for our first test day. I brought along both 115 and 124 grain ammunition from top companies to run through the Creed. As I loaded up the two provided 15 round magazines, I decided to start with shooting a few steel plates with the 115 grain ammo. The three dot sights sat high on top of the slide and in my opinion, in a manner not shooter friendly. Instead of all three dots being white or even a faster option of the rear dots being black and the front painted white, Walther designed the Creed sights to be white in the rear and black in the front. When trying to get on target quickly, the bright white rear sights in contrast with the black front sight seemed not only to slow me down by losing focus, but was also flat out annoying. Aiding in making the sights feel as if they towered above my shooting hand was the fact the height over bore axis was a bit much. The Creed reminded me of a SIG 220 .45 in that respect. Despite a relatively high bore axis offset, recoil was very manageable and comfortable as I tested both load weights. The trigger pull seemed to be longer than I was accustomed to with a bit of a gritty but not definite break point. I was very impressed with how short and smooth the reset was after breaking the first shot. However, the overall feel of the trigger felt as if I were pulling my finger through a cup of pudding. Once I finished the first rounds of shooting and needed to reload both magazines, I decided to measure the trigger pull. It consistently registered around the 6.3 – 6.5lb mark. This was a bit of a surprise due to the lighter feel of the trigger when shooting. Switching to the 124 grain ammunition, I could feel a slight decrease in felt recoil and comfort in shooting. Performance on steel for both the 115 and 124 grain ammo was relatively the same, although I did notice a slight reduction of muzzle flip with the heavier load. For the next round of testing, I shot several test sample groups with both loads. At the 10 yard mark, I could see roughly a .5 inch difference in groupings between 115 grain and 124 grain ammunition with the latter being the top performer. With having relatively smaller hands, the Walther Creed seemed to be a great fit to give a sense of the complete control of the pistol. This struck me as a very positive aspect to point out for both beginning shooters and female shooters who typically have smaller hands as well. To further look into this concept, I reached out to my local chapter of a national not-for-profit organization called The Well Armed Woman. Fortunately for me, the founder and current leader of the local chapter is also my wife, Candace Swanson. She and one of her co-leaders, Vicki Lee volunteered to get some trigger time with the Walther Creed and contribute their thoughts. Vicki Lee has been shooting for a couple of years now and has worked very hard on researching what she likes and doesn’t like in concealed carry options for her daily carry Glock 19 9mm. As part of The Well Armed Woman Shooting Chapters (TWAW) organization, Vicki has been able to try many popular high quality handguns on the market recently. 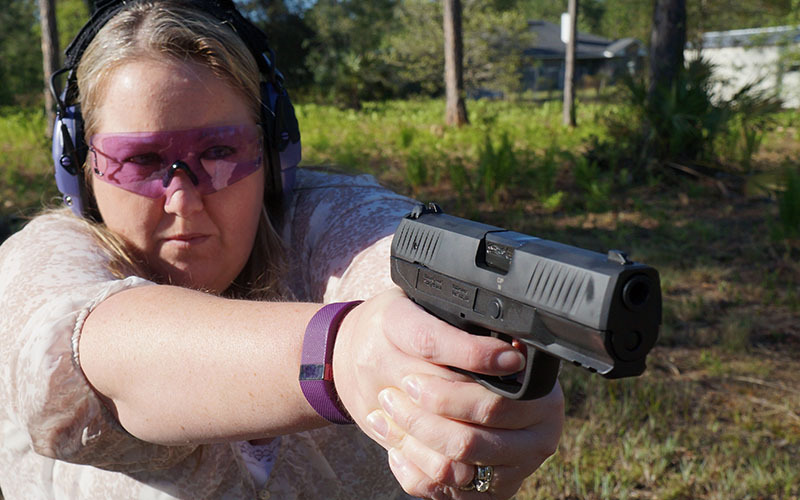 Below are her tough, no holds barred thoughts on the Walther Creed based on her time shooting it at a recent TWAW range session. Finally, I was able to have my wife and perhaps the most well rounded industry professional I know, Candace Swanson give the Walther Creed a whirl. Candace is not only the local chapter leader for north Jacksonville, but the overall leader for the State of Florida which includes 22 chapters and over 700 ladies as well. In her role as co-owner of the Swanson Media Group, Candace has access to well over 100 different firearms at any one time as well as every new gun that come in for review by Swanson Media Group. The daily carry of choice for Candace is the Glock 26 subcompact 9mm. As my time with the Walther Creed drew to a close after a couple of months, I was able to get a few trips to both “The Swamp” and our local indoor range to follow up on my initial thoughts when testing the pistol. The more I shot the Creed, the smoother the trigger started to feel despite still feeling like a bowl of pudding. A combination of just getting use to the trigger pull and putting enough rounds through the pistol to get a proper “break in” period could have played as huge factors in this. For the new shooter, this trigger would not be a major issue as it doesn’t promote the urge to jerk the trigger against the trigger break point. Break down of the Creed was made easy with just a simple flip of the take down lever. I have always been a fan of this procedure over pistols such as the Glock which requires the trigger to be pressed before releasing the slide. Both systems are safe, but by not having to press the trigger just gives me a better piece of mind when disassembling. Retailing for $399.99, Walther puts the Creed in the same market as Ruger’s American pistol as the two mid to full size 9mm pistols in the subcompact .380 price range. Measuring roughly the same size and round capacity as my daily carry Glock 19, the Creed comes in almost $200 cheaper while maintaining the integrity of Walther’s established quality and reputation. Having tested most of the other pistols in the Walther series as well as in its budget gun category, it’s my opinion that the Creed’s toughest competition comes from within its own company. 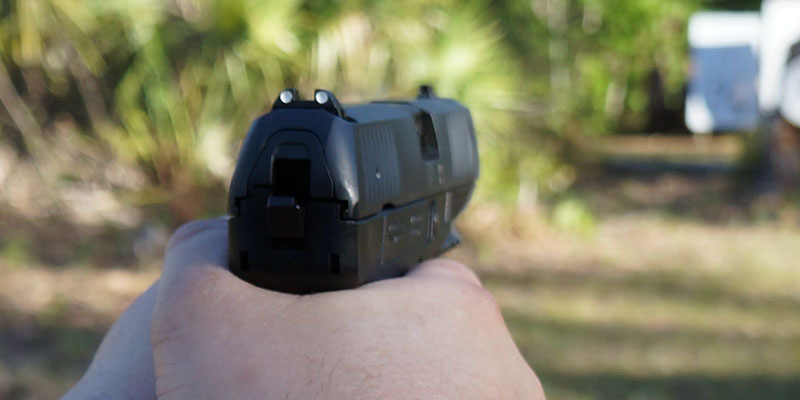 Walther’s more expensive pistols such as the PPX, CCP, PPQ M2 and fantastic optics ready Q5 Match (amazing trigger) offer all the bells and whistles that experienced shooters quickly get spoiled by using. In the end, I had to also keep in mind the original intent of the Walther Creed in providing an affordable and reliable pistol for new and budget minded shooters. After shooting the Creed and getting feedback from other shooters as well, I believe Walther accomplished this goal well. 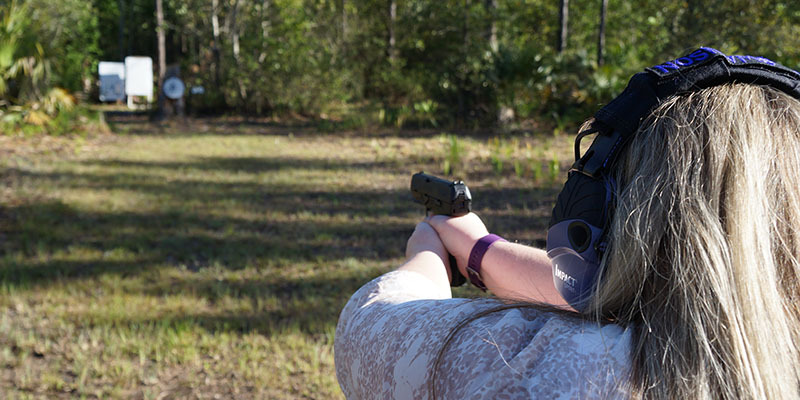 I recommend the Walther Creed to anyone looking for their first pistol backed by a greatly established industry “blue blood.” Special thanks to the wonderful ladies of The Well Armed Woman Shooting Chapters North Jacksonville, Florida for the assistance in bringing our readers a woman’s point of view on the Walther Creed. THE BOBCAT: A Woman’s Shoulder Holster!